Elon Musk says that next year SpaceX should demonstrate the ability to reuse one of the company’s launch vehicles, something that could reduce the cost of getting to space by a factor of 10. The idea of reusing spacecraft is not new. If SpaceX were to land and reuse one of its rockets it would be a first, and it would make the second launch much cheaper. The company has struggled to make the landings work in several experiments though, and Musk says the proceedure may not work reliably for some time. SpaceX’s rockets are used to launch satellites and to deliver supplies to the International Space Station. The company was recently awarded a multibillion-dollar contract to develop a vehicle for transporting astronauts to the ISS, which would eliminate the need to use Russian spacecraft. At a shipyard in Louisiana, SpaceX is building a floating platform measuring 90 meters long by 50 meters across. 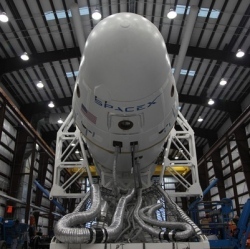 The company plans to land part of its Falcon 9 rocket on the platform after its next mission to the space station, planned for December 2014. Musk predicts a 50 percent chance of success. The company has previously performed a controlled landing into water, rather than on a platform. That attempt was partly successful, the rocket landed safely, but soon after it “tipped over and exploded,” Musk said yesterday at a symposium at MIT. Over the next year, SpaceX plans to carry out 12 missions, and he says there’s an 80 percent chance one of those will be successful, allowing the vehicle to fly again. “So we’re quite close,” he said at the event.